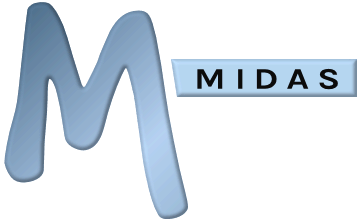 You can access MIDAS by entering the URL (internet address) of your MIDAS system into your web browser's address/location bar and selecting "Go" or pressing "Enter". To login to MIDAS, please enter your email address and MIDAS password. If multiple databases have been setup for your version of MIDAS, you may also be presented with an option to select which database you wish to login from a "Database" drop-down list. If your MIDAS administrator has enabled the multiple languages feature, you may also be able to select the display language for MIDAS from a "Language" drop-down list. If your MIDAS administrator has enabled the multiple themes feature, you may also be able to select a visual "theme" for your MIDAS experience. Select the "Remember Me?" option to have your browser remember your username, password, language, and theme settings for the next time you login to MIDAS on that computer. If you select the "Remember Me?" option, a further "Auto-Login?" option will be shown. Selecting "Auto-Login" before you login will mean that even if you close your browser, the next time you open it and navigate to your MIDAS, you will bypass the log in screen and be logged in automatically. To then login to MIDAS click/tap the "Login" button. Your MIDAS administrator may have enabled two-factor authentication for your system, in which case when you click "Login" you will be emailed an Authorization Code which will need to be entered to complete the login process. Your MIDAS administrator may also have set up your account to prompt you to change your password upon your first login. If your browser supports "Full Screen" mode, clicking/tapping the "Full Screen" link will maximize MIDAS to fill your entire screen (You can exit full screen mode at any time by selecting an "Exit Full Screen" link or by hitting Esc). Once logged in, you may log out of MIDAS at any time by using the "Logout" link under the main date near the top of the window.